Due to ongoing technical problems this pub is closed on 4/5/2015, and is unlikely to reopen in the foreseeable future. Went into this pub last week, in the evening. Not very many in there, and was surprised to see it's all underground. Some nice nooks with wooden tables, the space feels well looked after. Had the best pint of ale I've had in ages, the lines are obviously kept very clean, and the barman I spoke to seemed passionate about serving the best quality ale. However it's a bit pricey, think it was 3.50 a pint, which is a deterrent to someone quite skint. But the thought of that great pint will bring me back there. Popped in for a couple of pints at lunchtime today. The Koinoor (diamond Jubilee) was good. . But they charged �1.60 for a splash of lemonade with a spirit! Bloody expensive! And 3 rounds with same drinks each time - 1st was �11.30, 2nd was �12.90 (!!!!!) and 3rd was �11.10. When queried was tod �12.90 was correct! Not impressed. I occasionally pop in in the evening for a couple of beers and a bite to eat. 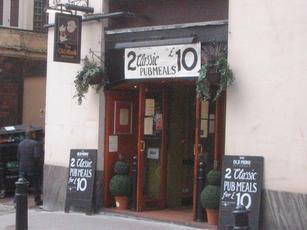 Good selection of well kept ales and the food is good quality pub style.